"Pinot blanc is pinot grigio with more character.” When you’ve been married to someone long enough, it’s easy to predict what he’ll say in certain circumstances. After nearly a dozen years of marriage, I can accurately forecast what’s about to come out of my husband’s mouth when myriad topics come up — including pinot blanc. 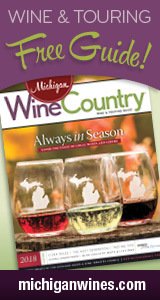 In her latest Hour Detroit Michigan wine blog, Cort examines why some wine experts have dismissed Pinot Blanc — but why many Michigan winemakers disagree. Have you been to Brys Estate, or had their wine before? Come tell us about your favorites on Facebook! Today's Prize: VIP pass valid for two guests, which entitles bearer to two souvenir logo glasses, two complimentary wine tastings, a complimentary five-item cheese and charcuterie board and two complimentary glasses of wine — a $55 value! Today's Prize: A Brys Estate VIP Pass, which entitles the winner to two souvenir logo glasses, two complimentary wine tastings, a complimentary five-item cheese and charcuterie board, and two complimentary glasses of wine — a $55 value!